Just in time for Halloween! 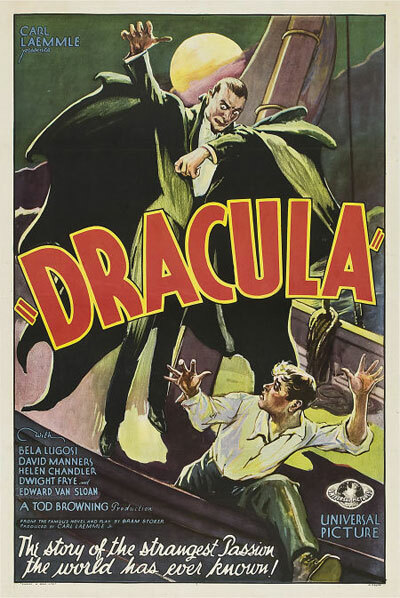 A campy lawyer becomes a bug-eating lunatic in thrall to the king of all vampires: Count Dracula, as personified by Bela Lugosi. 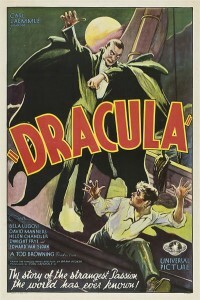 I compare the film to the Bram Stoker novel, to the stage play, and to other Dracula movies. I point out how the film set the standard for vampires from the incredible opening featuring the brides of Dracula (and the possums of Dracula) to the thrilling discussion-on-a-divan scenes to the pulse-racing discussion-on-a-staircase scenes to the chilling look-over-there-while-I-stab-Dracula ending. I mix up Joan Standing (the English nurse) and Moon Carroll (the American maid). Maybe there are no fangs and no blood (or score); maybe the actors all stand motionless to deliver their lines, maybe everything interesting happens off-screen, but this is the granddaddy of ’em all and well worth a look. Previous PostThe GooniesNext PostO Brother, Where Art Thou?